Baseball might be played by the boys of summer, but you can never turn off a rivalry. If you hate the Chicago Cubs like St. Louis Cardinals fans hate the Cubs, then even a horrible blizzard isn’t going to slow down the pain train. The above picture is across from beautiful Busch Stadium, in St. Louis, and it’s awesome. That took a lot of work and a lot of retracing steps to get such perfect letters and only one entrance/exit trail. Considering that this was done in the middle of the night and that it’s breathlessly cold outside, there’s some Cardinals fan out there getting treated for frostbite. It shouldn’t be hard tracking down the trespasser since he’s the guy with four toes. Then again, in baseball-mad St. Louis, they’d probably just give him a medal. Something like the Frozen Foot of Valor. Then again, what’s losing a toe or two when you can be an Internet legend like Rick Astley? 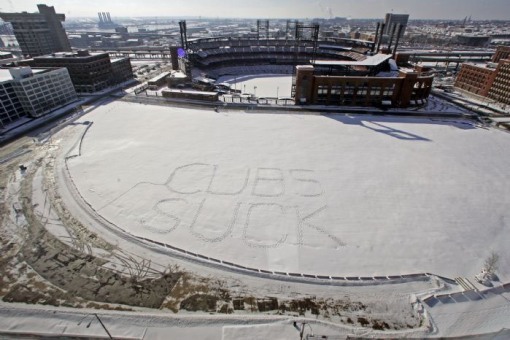 The sheer scope of this snow graffiti is incredible. It’s as big as the inside of Busch Stadium, if looks aren’t deceiving!